The Ballinasloe October Fair is known for its horse-dealing, crowded streets, and roaming minstrels. In October 2017, Alan Woods joined the festivities to present an ITMA lecture on the history of ballad sheets and street singers. Find out how he used materials from the ITMA collection to prepare. Event poster for Alan's lecture in the Ballinasloe Public Library. 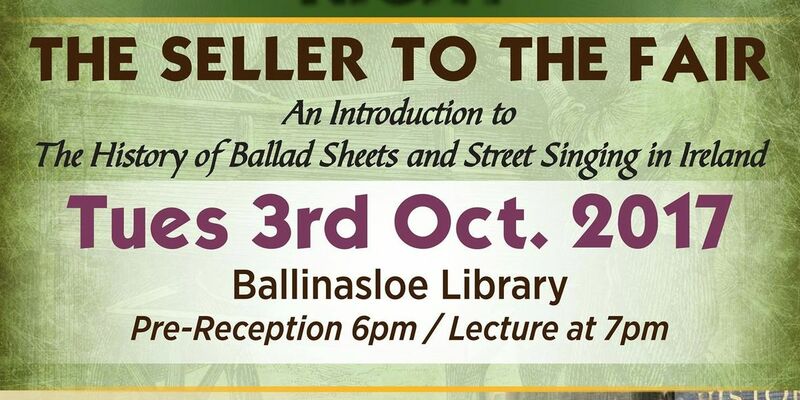 In September and October of 2017, I delved into the ITMA collection to learn more about the ballad sheet trade and street singers in Ireland. Many articles, essays, theses, and books have been dedicated to the history of ballad sheets, the printers of the ballad sheets, and the hawkers and street singers who sold them. Ye sons and daughters of Erin, Gather round poor Zozimus, yer friend; Listen boys, until yez hear, My charming song so dear. These are the words that one 19th century street singer and ballad hawker recited before each of his song performances in Dublin. His oration invited a crowd to gather around — an essential part of any ballad hawker's trade. A ballad sheet is a single sheet of inexpensive paper with a ballad printed on one side only. They are also referred to as broadsheets, broadsides, and/or slip ballads. Ballad sheets very often contain woodcut illustrations that bear no relation to the song printed on the paper. The earliest known ballad sheet printed in Ireland, Mount Taragh's Triumph, dates back to 1626. The ballad sheet trade in Ireland peaked during the 19th century, though there were still a small number of hawkers reported selling ballads in Ireland until the 1960s. ITMA holds a substantial quantity of these ballads sheets — originals and copies — spanning different generations, printers, and collectors. ITMA also holds a number of chapbooks and song garlands, which also were popular forms for selling and distributing ballads in earlier eras. 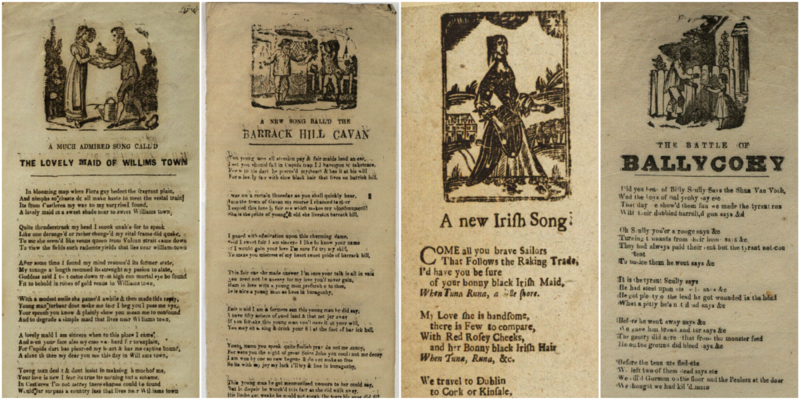 Two of the main ballad sheet collections held by ITMA are the Irish ballad sheets donated by Leslie Shepard and the ballad sheet scrapbooks that are featured as part of the P.W. Joyce microsite. The originals of the P.W. Joyce scrapbooks are held in Dublin City Library and Archive, Pearse St, Dublin 2; by kind permission of the Dublin City Library and Archive, ITMA staff were facilitated in digitising the scrapbooks, and further permission was given to freely publish them in facsimile as part of the ITMA Joyce Microsite. Follow the links to explore these resources. Selection of ballad sheets held in the ITMA collection. Much of the research about ballad sheets and their history has been committed to print. The ITMA library holds theses by John Moulden, Jen Headley, and Colin Neilands on the subject of ballad sheets. Many books, such as Songs of Irish Rebellion by George-Denis Zimmerman and Narrative Singing in Ireland by Hugh Shields, contain illuminating research on the history of the ballad sheet in Ireland. Articles and essays on this topic appear in a variety of music magazines and academic journals. One example is Maura Murphy's frequently cited article, which appeared in Ulster Folklife Magazine (Vol. 25). Maura Murphy's article about ballad singers and seditious ballads featured in Ulster Folklife Magazine (vol. 25). In addition to the many written descriptions, the collection at ITMA features a few first-hand accounts of the ballad sheet trade and street singing captured on audio recordings. Collectors like Alan Lomax and Séamus Ennis interviewed and recorded street singers from Ireland such as Margaret Barry and John Martin. Jim Carroll and Pat MacKenzie are two other song collectors who have preserved tales of the ballad sheet trade on tape. Originally from England, they now live in Miltown Malbay, Co. Clare. From 1973 onward, Jim and Pat recorded a vast store of songs, stories, and folklore from Irish Travellers based in London. They kindly donated copies of all the material they collected to ITMA. Selections of these recordings, including those featuring a particularly rich source of information about ballad sheets and street singing — a Traveller named Mikeen McCarthy — can also be found on the commercial recordings ... And That's My Story and From Puck to Appleby. 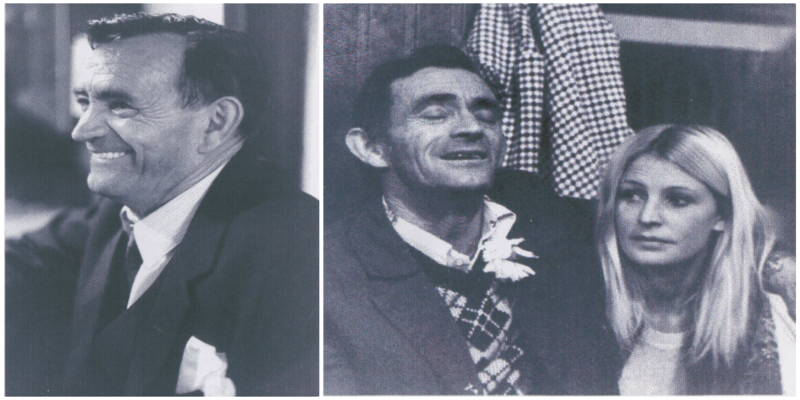 Mikeen McCarthy (left); Mikeen with his daughter, Jean 'Sauce' Driscoll (right; images © Pat MacKenzie). Michael 'Mikeen' McCarthy was born in Caherciveen, Co. Kerry in 1931. With his wife, Nonie Dooley, he first went to England in 1952 before moving permanently to London during the mid-1960s. Mikeen was skilled in a number of trades, including tinsmithing, horse-dealing, droving, and caravan building. As a teenager, Mikeen also worked as a ballad hawker at fairs and markets around Co. Kerry. Jim Carroll and Pat MacKenzie first met Mikeen McCarthy in a pub west of London in 1975. They became close friends with Mikeen and regularly visited, spending time with him up until his death in 2004. They collected a wealth of songs, stories, folklore, and Traveller lore from Mikeen — including many enjoyable accounts of his time selling ballads. In the following audio clip, Mikeen speaks with Jim Carroll about selling ballads. Mikeen McCarthy speaking about selling ballads sheets (recorded 1975). A mob is attracted by the song, and in whatever part of the street the ballad singer pleases to take his stand, business must be suspended and the shops shut up during his stay. In the following clip, Mikeen remembers a singer with this ability: a Traveller named Charlie Reilly. Mikeen McCarthy speaking about a street singer named Charlie Reilly. In this final audio clip, we hear Mikeen recounting a story of one of his most successful days selling ballads. Mikeen McCarthy telling a story about selling ballad sheets in Listowel (recorded ca. 1976). The material referenced in this blog is just a portion of what is held in the ITMA Collection related to ballad sheets and street singers. There are many more articles on the topic by people such as William Allingham, Alf MacLochlainn, and Julie Henigan. Plenty of written material has been published about the 19th-century ballad singer Zozimus, including his own memoir, and, thankfully, street singers from more recent times — like Margaret Barry and the Pecker Dunne — are well-documented in commercial recordings, such as I Sang Through the Fairs and Ireland's Own Pecker Dunne. I hope this material in the ITMA Collection will prove as valuable a source of interest and knowledge to others as it has to me. Alan Woods presenting his lecture in Ballinasloe library (photo © Jackie Dolan). 1 Atkinson, David, and Steve Roud, eds, Street literature in the long nineteenth century: producers, sellers, consumers (Newcastle upon Tyne: Cambridge Scholars Publishing, 2017), p. 127. 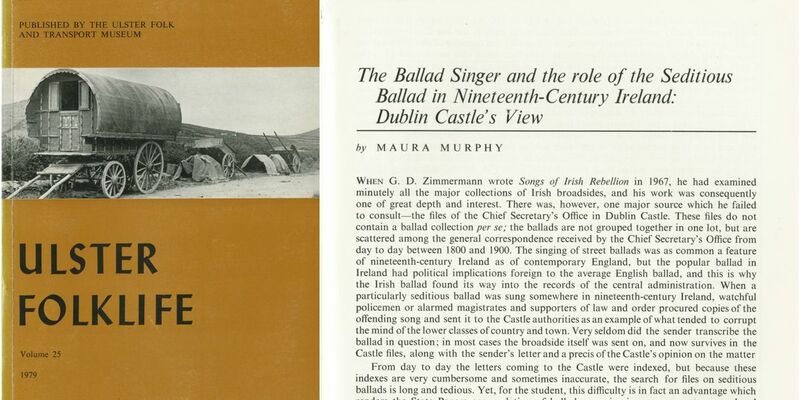 2 Murphy, Maura, "The ballad singer and the role of the seditious ballad in nineteenth-century Ireland: Dublin Castle's view" in Ulster folklife magazine vol. 25 (1979), pp. 90, 93. 3 Neilands, Colin Watson, Irish broadside ballads in their social and historical contexts, thesis vol. 1: Queen's University, Belfast, 1986, p. 318.